Good news this month on the legislative front: On April 29, Representative Sheila Jackson-Lee (D-TX) introduced HR 2160 -- the "Amateur Radio Emergency Communications Enhancement Act of 2009" -- in the US House of Representatives. This bill, if passed, would "promote and encourage the valuable public service, disaster relief, and emergency communications provided on a volunteer basis by licensees of the Federal Communications Commission in the Amateur Radio Service, by undertaking a study of the uses of Amateur Radio for emergency and disaster relief communications, by identifying unnecessary or unreasonable impediments to the deployment of Amateur Radio emergency and disaster relief communications, and by making recommendations for relief of such unreasonable restrictions so as to expand the uses of Amateur Radio communications in Homeland Security planning and response." The bill has been referred to the Committee on Energy and Commerce. More info here. Please write your congressmen for their support. Sad news this month on the personal front: Longtime ARRL volunteer official Sandy Donahue, W4RU, became a Silent Key. He was a good friend and colleague on many different projects over the thirty years that I knew him; he had a special devotion to the ARRL Field Organization and ARES. We didn't always agree on everything, but I always admired his dedication to Amateur Radio and the ARRL, over the course of several decades of service. He will be missed. More than 250 Amateur Radio operators provided communication support for the 113th running of the Boston Marathon on Monday, April 20, also known as Patriots' Day. The marathon used amateurs at the starting line, along the course at each water and first aid station, and at the finish line. Full story here. May 12 was Amateur Radio Operator Day in Puerto Rico, pursuant to a proclamation by Governor Luis Fortuno. Executive Director of the State Agency for Emergency Management and Disaster Administration Heriberto Sauri said "this administration recognizes the important work that the Amateur Radio operators do in Puerto Rico and around the world in emergency situations to protect the lives and safety of our citizens." An "Understanding of Cooperation" is in the works between the agency and radio amateurs. See the video here. The annual WX4NHC On-the-Air Station Test from the National Hurricane Center (NHC) in Miami takes place Saturday, May 30, 1300-2100 UTC. "The purpose of this annual Station Test is to test all of our radio equipment, computers and antennas using as many modes and frequencies as possible. This is not a contest or simulated hurricane exercise. New equipment and software will be tested, and we will also conduct operator training," said WX4NHC Assistant Amateur Radio Volunteer Coordinator Julio Ripoll, WD4R. Amateur Radio Supports BP MS-150 "Silver Celebration"
The BP MS-150 is a fundraising bike ride from Houston to Austin, Texas, organized by the Lone Star Chapter of the National MS Society. It is the largest bike ride in North America with 13,000 riders, 3,000 volunteers, supporters and spectators. Amateur Radio is an integral part of the communication system, which includes public service agencies, commercial radio systems, and the non-licensed Multi-Use Radio Service (MURS). The 150 Amateur Radio volunteers represented independent operators, local radio clubs across Texas, and ARES. The event was held April 19, 2009. Mike Hardwick, N5VCX, was chairman of the communications committee that coordinated the linking of a dozen repeaters over a distance of 150 miles. Many of the operators were veterans of hurricanes Katrina, Rita and Ike. Their ability to adapt, respond and overcome was evident this year. All communication network controls were located in the Houston Command Post. Two nets were established with back-up capabilities: One net was designated for general traffic and supply coordination, with the second net designated for medical emergencies. David Taylor, WD5DST, coordinated the amateur operators for medical assignments. Three ambulances, ten first responder teams, two supervisors and one medical transport unit were strategically placed along the route to respond to emergencies. Amateur operators were assigned to these sixteen vehicles. Medical units were equipped with APRS, allowing the prompt dispatching of the closest units. The eyes and ears along the route of the MS-150 were the motorcycle marshals. Many of these motorcycle volunteers obtained their ham licenses through classes conducted by Jerry Irwin, WAØGLD, who also coordinates the marshals. Sixty-two motorcycles were operated by Amateur Radio personnel, with twelve being APRS-equipped. Breakpoints were positioned every ten miles along the route. These rest areas provided water and snacks, medical aid, bicycle repair and restroom facilities. A team of amateurs including ARES members from Harris and Waller counties was assigned to each breakpoint to report conditions, request supplies and summon ambulances. ARES provided a large contingent of operators for the event. Many served independently at the command post and in medical and supply vehicles and the motorcycle marshals. As a group, ARES was tasked with establishing and operating the Special Assistance Group (SAG) responsibility for the transportation of cyclists who were unable to continue, from each breakpoint forward to Austin. The DECs from the South Texas Section districts 1 and 14 responded with volunteers. Christine Smith, N5CAS, District 1 DEC, recruited volunteers from Waller County, while Jeff Walter, KE5FGA, District 14 DEC, worked with his group in Harris County. Walter also coordinated the operations of all breakpoints and their associated functions. The SAG stops used Amateur Radio and MURS radios to coordinate buses, trucks, vans and personnel. ARES employed the Incident Command System of the National Incident Management System to develop incident action plans, training sessions with table top exercises and leadership development meetings to provide consistent operations along the route. The planning and training responsibility fell into the capable hands of veteran Del Partridge, W5QQ. In addition to their SAG responsibilities, the ARES members were originally tasked with operating the majority of the Amateur Radio stations at the breakpoints. The afternoon hours of May 8, will long be remembered in southern Illinois. In the course of a few short hours, the residents of central southern Illinois were subjected to greater than 100 MPH straight-line winds, torrential rain, and tornadoes. Area hams, active in SKYWARN nets, were busy. The preceding evening, severe thunderstorms had seen the Jackson and Williamson County areas pelted with golf ball-sized hailstones. Friday morning, the National Weather Service at Paducah, Kentucky, began again issuing severe weather alerts for the region. Flash flooding, severe thunderstorm and tornado watches were issued. Warnings soon followed, but there was no indication of what was to come. As Franklin, Williamson, Jackson and Perry County SKYWARN nets were activated (some for the third time that day), emergency managers also took to the roads, along with law enforcement and fire department observers.Several reports of funnels and tornadoes were communicated to the NWS office by SKYWARN observers, but this storm packed much more devastation than the EF0 and EF1 twisters that developed. This storm was unique in that its radar signature was not unlike that of a small hurricane. The steady, straight-line winds that this storm carried were measured at one regional airport at 106 MPH. That would place this storm in the Saffir Simpson hurricane intensity Category 2. Based on the assumption that wind gusts exceeded that measured steady wind speed, and, based upon the resulting damage observed during a survey of the western part of the storm's damage path, this storm would be properly placed into Saffir Simpson Category 3. The NWS now calls the storm a "meso cyclone." Other meteorologists have referred to the storm as a Derecho. Whatever it's called, it was a devastating weather system. Widespread, major damage to utilities and buildings resulted. More than 70,000 residents of this mostly rural area found themselves without power. Six southern Illinois counties have been declared disaster areas by Illinois Governor Pat Quinn. Utilities are still, as this is written on May 14, trying to restore power to approximately 15,000 residences and businesses. Primary AC lines in very rugged country including the Shawnee National Forest were destroyed, leading to the use of helicopters and bulldozers to ferry tools and materials to electricians and line crews, who are resorting to manual efforts to rebuild these HV towers and lines. Hundreds of thousands of trees were felled. Many homes and businesses were destroyed, and, there has been one storm-related fatality reported. When this storm hit, we, here in my hometown of Benton, were subjected to strong winds, lightning, and very heavy rain. The wind, at that point, was from the southwest. Our SAME weather alert receivers were constantly alerting, as reports of funnels and tornadoes were broadcast. Then, the 'eye' of the storm passed over us, and, just as with a tropical depression or hurricane, we enjoyed a brief lull. All was calm for about 25 minutes, and, save for the eerie, greenish cast to the sky, it could have been any other spring day in southern Illinois. Then, the back side of the cyclone hit us, with winds from the northwest. The sky was instantly filled with blowing debris and rain being horizontally driven by the shrieking winds. Visibility was reduced to less than 50 feet, and, in our basement, my wife and I watched as water was, literally, blown through our concrete block walls. As the Illinois SEC, I try to set a good example in terms of emergency preparedness. Most of my emergency supplies are kept ready in a 37' fifth wheel camper, along with my field-deployable emergency communications gear. Ironically, on Thursday morning, my wife and I had pulled that camper to a dealership in the county south of us - Williamson -for some minor repairs. [Williamson County is where Friday's wind speed of 106 MPH was measured]. Our camper was a casualty, first, of Thursday's hail storm, which shattered all of the roof vents and opened the camper's roof to the rain, and, then, the meso cyclone hit on Friday. Our 14,000 pound camper was pushed off its blocks and scooted across the dealer's yard like a kid's toy. Here at home, half of a 100' oak adjacent to our property was felled by the storm. Members of the Toledo-Lucas County (Ohio) ARES Group demonstrated their skills providing communications for the 33rd Glass City Marathon on April 26. Hosted by the Toledo Road Runner Club, almost 2,000 runners from 24 states and Canada participated. Thousands of spectators lined the route. Steve McEwen, K8BBK, (left), Wood County ARES, monitoring radio traffic at Water Stop 10. Rick Sharpe, K8RKS, ARES Race Coordinator, faced many technical challenges linking race and safety officials. Starting in downtown Toledo, runners raced on both sides of the scenic Maumee River, through two counties and several communities, each with different public safety radio frequencies. The interoperability solution was ARES Amateur Radio operators. The nerve center was the Lucas County ARES Command Center. Consisting of a renovated ambulance with attached trailer-radio-situation room, the unit was stationed downtown near the starting line. It served as platform for Net Control on a 2 meter repeater atop one of Toledo's tallest office buildings. Twenty-three ARES field operators with HTs along the course and in vehicles worked through the repeater to Net Control with their communications. Lucas County's ARES Command Center is well designed for the task. Both parts are self contained and not reliant on commercial power. Each is a duplicate of the other so they can be separated and used at two different scenes. Most impressive were the banks of radios from amateur to area police, fire, EMA, and EMS agencies. A corn row of antennas lined the roof. All were used to make the marathon happen. 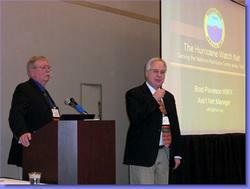 Amateur Radio had its largest presence ever at the 2009 National Hurricane Conference in Austin, Texas. Representatives from the ARRL, WX4NHC, the Amateur Radio Station at the National Hurricane Center (NHC), the Hurricane Watch Net (HWN) and VoIP Hurricane Net (VoIPWXNet) completed several presentations at the conference as well as a presentation at the local Austin Amateur Radio Club. 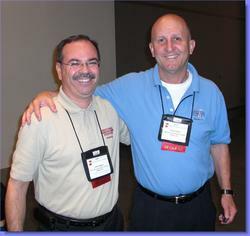 Julio Ripoll, WD4R, (left), with veteran NHC forecaster Dr. Lixion Avila (Rob Macedo, KD1CY, photo). The Amateur Radio Disaster Communications Workshop was held April 7 with WX4NHC Amateur Radio Coordinators John McHugh, K4AG, and Julio Ripoll, WD4R, explaining their work at the National Hurricane Center and the importance of measured surface data and damage reports to allow hurricane specialists to make better forecasts. Rob Macedo, KD1CY, Director of Operations of the VoIP Hurricane Net, gave a presentation on the net and the role it plays in gathering data for WX4NHC and how it also can be used to connect various NWS Forecast offices and local and regional EOCs together during hurricanes. Macedo also presented the importance of IRESC, the International Radio Emergency Support Coalition, and its role in providing translators and additional contacts in the affected area during hurricanes and other disasters. ARRL's Dennis Dura, K2DCD, addresses the group, with HWN Assistant NM Brad Piovensen, W9FX, at podium (KD1CY photo). Brad Piovensen, W9FX, Assistant Net Manager of the Hurricane Watch Net, discussed potential changes in their operations that will include not just monitoring of their traditional 14.325 MHz frequency but also monitoring 40 and 80 meter bands given the need for the net to expand its reach. On April 8, ARRL's Dennis Dura, K2DCD, and Macedo, gave a workshop on situational awareness and how it creates more opportunities for Amateur Radio. Most of the attendees were representing emergency management and other government agencies. Most ARES communications are performed on 2 meter FM and for good reasons: The majority of amateurs own 2 meter FM radios and many have mobile installations that provide great coverage in most urban and suburban areas. There are in many areas so many repeaters up that there is a waiting list for frequencies. For many events here in Northern Virginia, a handheld radio will do the job well. We do, however, have some events that are run in large, forested park areas where 2 meter repeater coverage is poor or in some cases, the repeaters that cover areas are also popular on weekends with the clubs that sponsor those repeaters. It can be unfair to run a 50 mile event and tie up a wide area repeater for a day. Our solution was to try other VHF bands. While most of us also have 440 MHz FM gear, we found that it did not provide the range in wooded areas. We went to 6 meters for several reasons. First, there are many amateurs who own the ICOM IC-706 and other compact radios that have 6 meter FM capability. The coverage of 6 meters in a wooded environment is unbelievably good. We have found that a 5 watt 6 meter simplex FM signal can be heard more clearly then a 50 watt 2 meter simplex signal. We have two events that are along the Occoquan Reservoir in Fairfax County, Virginia and two other events that are run along the Potomac River from Alexandria to Mt. Vernon. We've found that 2 meter repeater coverage along both the reservoir and the river is not good and running events with mobile equipment on 2 meter simplex is not the best approach. When trying 6 meters we found that coverage was much better. While there are many commercial 6 meter FM radios on the market, there are also many surplus commercial radios available if you can find the right ones and they are properly converted. In our area, one of the members of the Amateur Radio Research and Development Club (AMRAD) picked up a truckload of Midland commercial radios and figured out how to convert them to the 6 meter band. Most of them have 22 channels and must be programmed by using a computer program and a serial cable with a non-standard connector to the radio. With 22 channels, you will have all of the simplex frequencies and many 6 meter repeater pairs in your area. I'm sure that there are Motorola models that can be had as well. Commercial gear has a few advantages over our amateur equipment. One is that it is easy to use. Turn it on, set the channel, set the squelch and talk. These radios are generally bullet proof; they will take more abuse. They were designed to live in cabs, trash trucks, and police cars. They also have a great deal of audio gain available. If you are in a high noise environment you will still be able to hear your traffic. Six meter antennas are another consideration. For mobile operations, you can use a 2 meter 5/8th wave that also loads up as a ¼ wave on 6 meters. Alternatives are home made or commercially made ground planes, J-poles, and dipoles. I use a 6 meter Ringo for portable use on a set of military mast sections. I've marked the vertical parts so they can be collapsed for easy transport and set up quickly. If your ARES unit or club decides to use commercial 6 meter equipment, I recommend that you determine a few simplex frequencies that should be programmed into all radios. Two popular frequencies in Northern Virginia are 52.02 MHz and 52.51 MHz. I recommend that you stay away from 52.525 MHz as it is the national calling frequency and when 6 meters is open you may get check ins from all over the country. Here is an emergency call-out notification resource that is widely available, but I am not sure is being widely used: So-called "Reverse 911" systems. Usually thought of as a means for emergency managers to send telephone messages to the public based on the recipient's location, these systems can be used for much more. Good systems can send messages to telephones, cellular phones, SMS, pagers, fax machines, and e-mail. Really good systems record a response and can even ask polling questions, such as "Can you respond to the EOC and, if so, when will you arrive?" Properly known as "Telephone Emergency Notification Systems" or TENS, these capabilities are often sold to local government as a service with per-call billing. Often the pre-paid calling included in the contract goes unused, waiting for a major event that never occurs. All of the TENS systems I am aware of also support notifications for emergency responders. In most, the responder provides details of all the ways they can be contacted and, in an emergency, the system uses them one-by-one or all at once until the message is received. Profiles allow recipients to select the best way to reach them at a particular time-of-day, and to prevent the system from calling at other times, if desired. Our ARES group has begun using such a system for notifying members when their help is needed--as well as drills and occasional system tests to keep people aware it exists. We are just getting started, but already another nearby county is following our lead, using a TENS system our state makes available to public health agencies for free. I think many agencies that have a TENS available treat it like some kind of a doomsday system, when it really could be used for all sorts of things, including an off-the-repeater way of notifying ARES members that we need their help right away. In 1960, Louisa, Kentucky, saw the emergence of a new ham, Curtis (Fred) Jones, WN4ETV (now WA4SWF) at the age of 16. He went on to give a lifetime of service to his community, county and anyone interested in Amateur Radio. He was an Elmer to many hams. Jones constructed a working Kentucky District 9 ARES. He served 35 years as EC. During his ARES career he held the positions of DEC, OES, OBS, AEC and ASM. He was Vice President of the Big Sandy Amateur Radio Club and just this year retired as Treasurer. He joined the Morning Kentucky Phone Net and the evening Kentucky Traffic Net. He called these nets at least once a week for many years and was a regular check into the Kentucky CW nets. Jones was Disaster Emergency Service Director for Lawrence County, holding that position for 12 years. He became the first Director of the South East Repeater Association (SERA) for Kentucky and was instrumental in setting up the standards of repeater coordination. He then went on to serve as editor of the SERA Journal, a monthly publication for seven states. ARES Legend Fred Jones, WA4SWF, (left), receives award plaque from John Meyers, NB4K. On May 2, Fred retired. 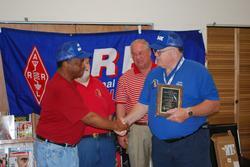 He was presented with a plaque from Jim Weaver, K8JE, ARRL Great Lakes Division Director, for his years of service. The honor was presented by Jim Brooks, KY4Z, Kentucky Section Manager, Matt Tinker, AA4XA, Assistant Section Emergency Coordinator and John Meyers, NB4K, past Kentucky Section Manager, current Great Lakes Division Legislative Action Chairman and Assistant Great Lakes Director. Many ARES organizations provide detailed accounting of their volunteer efforts to their served agencies. This usually includes break-downs for man-hours, including a calculation of the monetary value of services provided by Amateur Radio. The value of these services is usually taken from a variety of sources including the Bureau of Labor, VOAD, etc. But increasingly volunteer organizations are using the estimates of a group called "Independent Sector." Independent Sector has announced that the 2009 estimate for the value of a volunteer hour is $20.25 per hour. Organizations can use this number to quantify the enormous value volunteers provide. Last year's estimate was $19.51. The hourly value of volunteer time is based on the average hourly wage for all non-management, nonagricultural workers as determined by the Bureau of Labor Statistics, with a 12 percent increase to estimate for fringe benefits. Independent Sector will release updated figures for each state later this spring. Last month, this column featured an editorial on recruitment issues, and contained the story of a bright, young new ARES op: Jacob Romine, KJ4HJO, is a 12 year old that has been active in the Limestone County (Alabama) ARES group since getting his ham license in October as an 11 year old. Jacob is the grandson of Felix Birdwell, KD4NTK, AEC for Limestone ARES. Here is Jacob's photo, which we didn't have in time for the last issue. We need a lot more Jacobs in ARES across the country. Go get 'em! Copyright © 2009 American Radio Relay League, Incorporated. Use and distribution of this publication, or any portion thereof, is permitted for non-commercial or educational purposes, with attribution. All other purposes require written permission.